Your business wouldn’t run without vendors, so why not keep all of your vendor information where you keep the rest of your business information? 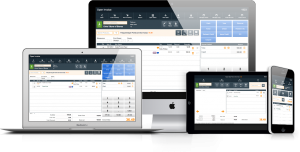 PayGo’s vendor organization software is a thorough and simple resource to keep all of your vendors, manufacturers, or consignors organized in one easy-to-access place. You can add a new vendor on your central Vendors screen, accessed via the Menu, by clicking the New Vendor button at the top of the screen. Alternately, you can click the Plus button next to the Vendors button on your Menu. Both of these actions will open the Vendor/Consignor/Manufacturer Entry screen. In the topmost right corner of this screen, you will see a number. This is PayGo’s automatically generated Vendor ID number. Across the top of the screen, you will see several buttons. With the exception of the Close and Vendors Central buttons, these pertain to adding consignors. For more information on adding consignors, see Adding New Consignors to PayGo. Close: This will exit out of the Vendor/Consignor/Manufacturer Entry screen and bring you back to to your central screens. The new vendor entry will be saved automatically, even if you haven’t entered any information. You can locate it again by it’s Vendor ID. Vendors Central: This will close the screen and return you to the central Vendors screen. This is where you will add all basic information for the vendor. There is room for the vendor’s full address, as well as the vendor’s website and contact information. You can click the Letter icon next to the Email field to open your preferred email system and email the vendor, or you can click the Globe icon next to the Website field to open your browser and view the vendor’s website. This is where you can choose what Record Type the vendor is: Vendor, Supplier, Manufacturer, Consignor, Vendor & Manufacturer or Other. Choosing Other will prompt a pop-up box where you can enter your own record type. You can also add any comments on the vendor you’d like, as well as a vendor Picture. In this tab, you can also add your Account Number, as well as the vendor’s Payment Terms and Minimum Order Amount per purchase order. This is where you can see the all inventory carried by this vendor that you’ve carried in your stores, including sold items. Each Item will be listed with its Type, Commish %(commission percentage), Price, amount On Hand, and the date it was Sold (if applicable). This is where you can see sales that have been made with this vendor’s inventory. Within this tab, you can select a date range to analyze, and be shown each sold item’s Item Name, the Invoice ID it was sold on, Qty (quantity) Sold, Extended price, Commish Amt (commission amount), Date Processed, and the Check # (number). This tab pertains mostly to consignors. If your consignor or vendor is also a customer, you can link their customer account to their consignor or vendor account. When any information is added into this screen, a Jump to Customer button will appear, which will open the Customer Entry screen. This is where you can add information about your contacts within the vendor’s organization. You are able to add the contact’s first and last name, as well as their phone number and extension. If you would like to add more information to this, click the Magnifying Glass icon after you’ve entered the contact’s name. This will bring up the Contact Entry screen. In this screen, you can enter information such as the contact’s title and any record number you might have for them, any additional phone numbers they might have, what department they work in, and any special notes you’d like to add. Qty Sold: This will tell you how many items from this vendor you’ve sold within the specified date range. Total L Cost: This is the total last cost of the items purchased from the vendor. Total A Cost: This is the total average cost of the items purchased from the vendor. This will show as both a dollar amount and a percentage. Margin Last Cost: This is the margin from the last purchase order with the vendor. This will show as both a dollar amount and a percentage. Margin Average Cost: This is the average margin from all purchase orders with the vendor. This will show as both a dollar amount and a percentage. Total Sales: This will show a dollar amount of the total sales you have made from this vendor’s items. Created: the date the adjustment is created. This will auto-populate once an item is entered. Item ID: the item ID number within your PayGo software. If you add this number first, the item’s name will be automatically applied. Name: The name of the item that the adjustment is being applied to. Amount: This is the amount of the adjustment to be applied. This can be entered as both a positive and negative number. Notes for Vendor: This is where you can add any type of vendor notes you’d like to add to the adjustment. Type: Clicking this will open a drop-down menu where you can choose if the adjustment is a Monthly, Yearly or One-Time occurrence. Last applied: This will show you the last time the item was adjusted. You can also delete adjustments by clicking the Trash icon to the right of each adjustment entry. When all information is entered, simply close out of the Vendor/Consignor/Manufacturer Entry screen. All of your changes will be saved automatically.